Microsoft researchers have announced their latest research project, which will enable users to turn everyday objects into 3D models using their phones. The software would enable Windows phone users to use what they call “Skynet UI” to scan physical objects and transform them into 3D models. The process was revealed late last year but has since become simpler to navigate and easier for everyday consumers to use. Last year when the process was revealed, the 3D reconstruction process was being created to allow users to create and recreate 3D images. But as research has advanced, along with technology, so has the process of creating 3D models. With “3D reconstruction” combined with the Skynet UI feature, the process has been made simpler. Microsoft adds that the Skynet UI design aims to enhance user experience and lower the barriers between customers and the 3D reconstruction process. It allows for a user to scan an object and the program on the camera will gives cues of when and where to move the camera. The image can then be sent to a 3D printer. The three research scientists behind the project, Jiawei Gu, Rishard Cai, and Zhiwei Li, have shared their work online, demonstrating how the process will work. 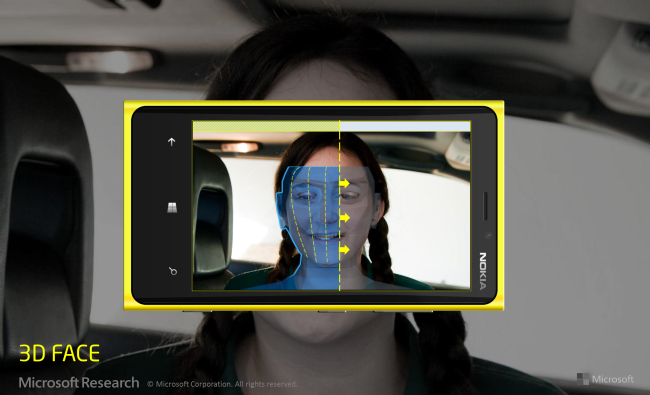 Using a Windows phone handset, you can simply take a 360-degree photo using the program the camera gives you. The combined process allows you to make a high-quality 3D scan of a face that can ultimately be turned into a 3D printed model if you so desire.